Edward Hopper (July 22, 1882 - May 15, 1967) was an American painter and printmaker. While most popularly known for his oil paintings, he was equally proficient as a watercolorist and printmaker in etching. Born in upper Nyack, New York to a prosperous dry-goods merchant, Hopper studied illustration and painting in New York City at the New York Institute of Art and Design. One of his teachers, artist Robert Henri, encouraged his students to use their art to "make a stir in the world". 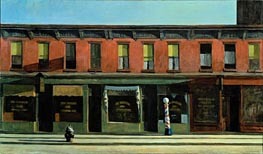 Henri, an influence on Hopper, motivated students to render realistic depictions of urban life. Henri's students, many of whom developed into important artists, became known as the Ashcan School of American art. Hopper studied under Henri for five years. 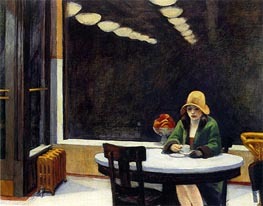 Upon completing his formal education, Hopper made three trips to Europe, each centered in Paris, to study the emerging art scene there, but unlike many of his contemporaries who imitated the abstract cubist experiments, the idealism and detail of the realist painters resonated with Hopper. His early projects reflect the realist influence with an emphasis on colour and shape. Eschewing the usual New England subjects of seascapes or boats, Hopper was attracted to Victorian architecture, although it was no longer in fashion. According to Boston Museum of Fine Arts curator Carol Troyen, "He really liked the way these houses with their turrets and towers and porches and mansard roofs and ornament cast wonderful shadows. He always said that his favorite thing was painting sunlight on the side of a house." While he worked for several years as a commercial artist, Hopper continued painting with moderate success yet not as much as he wanted. He sold a variety of small prints and watercolors to tourists and minor publications yet received only a casual if warm response from curators and gallery owners. According to Troyen, Hopper's "breakthrough work" was The Mansard Roof, painted in 1923 during Hopper's first summer in Gloucester, MA. His former art school classmate and later wife, Josephine Nivison Hopper, suggested he enter it in the Brooklyn Museum annual watercolor show, along with some other paintings. The Mansard Roof was purchased by the museum for its permanent collection, for the sum of $100. In 1925 he produced House by the Railroad, a classic work that marks his artistic maturity. The piece is the first of a series of stark urban and rural scenes that uses sharp lines and large shapes, played upon by unusual lighting to capture the lonely mood of his subjects. He derived his subject matter from the common features of American life gas stations, motels, the railroad, or an empty street and its inhabitants. Hopper continued to paint in his old age, dividing his time between New York City and Truro, Massachusetts. He died in 1967, in his studio near Washington Square, in New York City. His wife, painter Josephine Nivison, who died 10 months later, bequeathed his work to the Whitney Museum of American Art. Other significant paintings by Hopper are at the Museum of Modern Art in New York, The Des Moines Art Center, and the Art Institute of Chicago. Though Hopper's works are very accessible, he was seen, often, as extremely alienated since he had given up commercial illustration to dedicate his professional life to painting. The most well known of Hopper's paintings, Nighthawks (1942), shows customers sitting at the counter of an all-night diner. The diner's harsh electric light sets it apart from the dark night outside, enhancing the mood and subtle emotion of the painting. The painting conveys the elements of confinement and isolation. One critic, Walter Wells, sees in the picture the influence of Ernest Hemingway's story, "A Clean, Well-Lighted Place," both picture and story representing a "sanctuary against the ultimate night [i.e. death] in a world without God or spiritual solace." Hopper's rural New England scenes, such as Gas (1940), are no less meaningful. "Gas" represents "a different, equally clean, well-lighted refuge.... ke(pt) open for those in need as they navigate the night, traveling their own miles to go before they sleep." Brilliant sunlight (as an emblem of insight or revelation), and the shadows it casts, also play symbolically powerful roles in Hopper paintings such as "Early Sunday Morning" (1930), "Summertime" (1943), "Seven A.M." (1948), and "Sun in an Empty Room" (1963). In terms of subject matter, Hopper can be compared to his contemporary, Norman Rockwell. Hopper's work exploits empty spaces, represented by a gas station astride an empty country road and the sharp contrast between the natural light of the sky, moderated by the lush forest, and glaring artificial light coming from inside the gas station. Most of Hopper's paintings have a concentration on the subtle interaction of human beings with their environment and with each other. Like stills for a movie or tableaux in a play, Hopper positions his characters as if they have been captured just before or just after the climax of a scene. 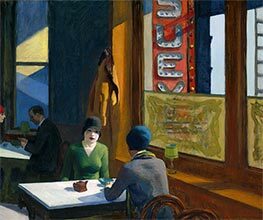 In 1980 the groundbreaking show, "Edward Hopper: The Art and the Artist," opened at the Whitney Museum of American Art and visited London, Dusseldorf, and Amsterdam, as well as San Francisco and Chicago. For the first time ever, this show presented Hopper's oil paintings together with drawings on paper, which were his studies for those works. This was the beginning of Hopper's popularity in Europe and his large world-wide reputation. In 2004, a large selection of Hopper's paintings toured through Europe, visiting Cologne, Germany and Tate Modern in London. The Tate exhibition became the second most popular in the gallery's history, with 420,000 visitors in the three months it was open. In 2007, an exhibition focusing on the period of Hopper’s greatest achievements from about 1925 to mid-century was under way at the Museum of Fine Arts, Boston. The exhibit comprises fifty oil paintings, thirty watercolors, and twelve prints, including the favorites Nighthawks, Chop Suey, and Lighthouse and Buildings, Portland Head, Cape Elizabeth, Maine. The exhibition was organized by the Museum of Fine Arts, Boston, the National Gallery of Art , Washington, The Art Institute of Chicago and sponsored by the global management consulting firm, Booz Allen Hamilton. Hopper's influence on the art world and pop culture is undeniable. Homages to Nighthawks featuring cartoon characters or famous pop culture icons such as James Dean and Marilyn Monroe are often found in poster stores and gift shops. Although this example does not, Hopper often used his wife as the model for female figures. The cable television channel Turner Classic Movies sometimes runs a series of animated clips based on Hopper paintings prior to airing films. 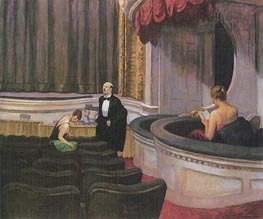 Hopper's cinematic, wide compositions and dramatic use of light and dark has also made him a favorite among filmmakers. For example, House by the Railroad is said to have heavily influenced the iconic house in the Alfred Hitchcock film Psycho. The same painting has also been cited as being an influence on the home in the Terrence Malick film Days of Heaven. Noted surrealist horror film director Dario Argento went so far as to recreate the diner and the patrons in Nighthawks as part of a set for his 1976 film Deep Red (aka Profondo Rosso). In 1993, Madonna was inspired sufficiently by Hopper's 1941 painting, "Girlie Show", that she named her upcoming world tour after it and incorporated many of the theatrical elements and mood of the painting into the show. To establish the lighting of scenes in the 2002 film Road to Perdition, director Sam Mendes drew from the paintings of Hopper as a source of inspiration, particularly New York Movie. In 2004 British guitarist John Squire (formerly of The Stone Roses fame) released a concept album based on Hopper's work entitled Marshall's House. Each song on the album inspired by, and sharing its title with, a painting by Hopper. Canadian rock group The Weakerthans released their album Reunion Tour in 2007 featuring two songs inspired by and named after Hopper paintings, "Sun in an Empty Room", and "Night Windows", and has also referenced him in songs such as "Hospital Vespers". Polish composer Pawel Szymanski's Compartment 2, Car 7 for violin, viola, cello and vibraphone (2003) was inspired by Hopper's Compartment C, Car 293. German film director Wim Wenders's 1997 film The End of Violence incorporates a tableau vivant of Nighthawks, recreated by actors. Each of the 12 chapters in New Zealander Chris Bell's 2004 novel Liquidambar (UKA Press/PABD) interprets one of Hopper's paintings to create a surreal detective story. Hopper's influence reached the Japanese animation world in the dark cyberpunk thriller Texhnolyze. 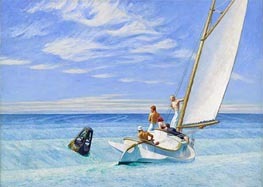 Hopper's artwork was used as the basis for the surface world in Texhnolyze. Hopper's painting Early Sunday Morning was the inspiration for the sleeve of British band Orchestral Manouevres in the Dark's 1985 album, "Crush"
Hopper's Painting New York Movie was featured in the Tv Show Dead like Me. The Girl standing in the corner was compared to the character of Daisy Adair.